Skip to the first heading below if you wish to skip my introductory rambling. I should have said in my first post that my analysis is not meant to be completely serious. I'm serious all day at my "day job"; this is just for fun. My goal is for you to read this and think "huh, that's kinda neat." Mike Fast correctly stated that the Kalk interpretations of the Pitch-f/x data are not definitive, as we already saw with Litsch, Doc, and others. That's fine; I previously stated that I have no issues with Kalk's classifications, simply because I don't have the time, initiative, or ability to crunch the numbers myself. There is much to be gained from deep analysis of a particular pitcher's pitches (to create a tongue-twister there) but I'm more interested in the team as a whole, so I'm generally not going to look too closely at anyone during this little series. I also wish I remembered more R tricks from last year's stat course, but such is life. Very well. Here's a closer look at each pitcher's main fastball. The word "main" should be self-evident for most pitchers, based on the frequency plot shown in the last post, but there are a few I need to think about for a moment. Based on the assumption that a pitcher's main pitch is the one he throws a) most of the time and/or b) when he's behind in the count, I'll consider Halladay's sinker, Janssen's cutter, Marcum's regular fastball, and Litsch's...well, I won't include Litsch. Sorry, I know that's hand-wavey, but here's the data table. And here's the graph, with the same scale that Kalk used in his horizontal/vertical break graphs. The points aren't labelled, but the two lefties (Downs and Tallet) are on the right. Janssen's all by himself in the middle. We know Halladay's sinker can induce groundballs, and its appearance at the bottom-left of the RHP cluster is no surprise. Accardo throws really fast. Or not. 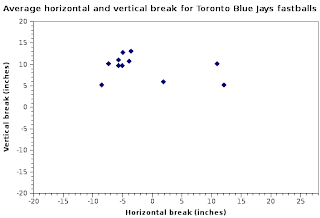 This is one of those inaccuracies I was talking about -- the fastball speeds at Rogers Centre can be kind of high. Average speed of 94.9? I don't know so much. Break-wise, Accardo's fastball is very similar to McGowan and Burnett. Speaking of Peaches and AJ, as you might expect from watching them pitch, they're the two pitchers with the most similar fastballs, break-wise, on the Jays. Towers' is also quite similar in this way. And that's about the only similarity between him and them. Ohka's fastball: 86.6 mph (averaged over 226 pitches, though). Most of his pitches were between 78 and 88, which isn't surprising in the least. If you're still curious about Litsch, you can read this post or this one, both by Jonathan Hale. You can also check out Mike Fast's catalog of articles from around the web, organized by pitcher, for more information on Halladay, Burnett, McGowan, or others.